Why venture capital won’t venture out. JOHN SCHNIPKOWEIT shouldn’t have problems finding investors. A few years ago, he started and sold a business that set up WiFi hotspots at hotels and airports. His new project, a Facebook application that helps organize after-work sports leagues, employs seven people and is doing well in private beta testing. In Silicon Valley, which loves ideas that disrupt hidebound folkways, it’d get funded in a second. All the same, Schnipkoweit wants to stay in his hometown, where he’s helping transform a flood-damaged area into a district called New Bohemia. Named after the old Czech neighborhood across the river, it has a bar, a bookstore, and a bike co-op—all the elements that creative-class gurus like Richard Florida say are essential for a start-up-friendly community. This difficulty matters well beyond the frustrated techies of Iowa. It upends the myth that technology has effectively collapsed distance, allowing people to network and communicate and collaborate with folks in Chennai or Chongqing (or Cedar Rapids) as if they were right down the block. In fact, it turns out that, instead of using Silicon Valley innovations to scout far and wide, venture capital has remained stubbornly—and foolishly—local. THE IDEA that every town is a few coffee shops away from being a tech hub rests on a couple of recent developments. The cost of servers and software has tumbled since the last boom, meaning that a good idea can become a viable product for only a few thousand dollars. And when founders on Main Street need more money, social media is supposed to seamlessly connect them to funders on Sand Hill Road. In recent years, a whole start-up-promotion-industrial complex has helped sell this idea. The White House-backed, privately funded Startup America Partnership threw parties at both conventions this summer, preaching to state legislators about helping start-ups thrive. An arm of the philanthropic Kauffman Foundation stages “Startup Weekend” events around the country and beyond. Another beneficiary, Silicon Prairie News, focuses on Iowa, Missouri, and Nebraska. But Silicon Valley’s kingpins also act like local yokels for reasons that have more to do with psychology. “Most V.C.s are network-driven,” says Sanwal. “There’s this myth within venture that everybody has access to ‘proprietary deal flow’” by knowing the right people. 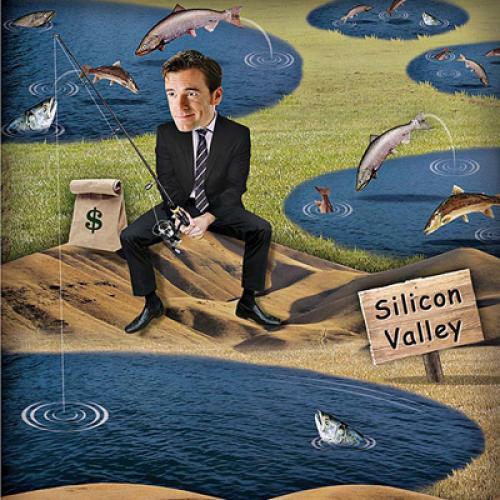 Like any online social network, Silicon Valley’s deal-making network can be self-perpetuating. In this case, though, it’s a physical network grounded in a specific place—one that’s hard for someone like Schnipkoweit to reach, no matter how robust his Facebook presence. At least some V.C.s have profited from flying to the provinces, investing in tech success stories like the online-payment firm Dwolla (in Des Moines) and the online meat market AgLocal (in Kansas City). Other fly-over-land start-ups have found partners even farther away: The Iowa-based personal-savings tool SocialMoney added dozens of jobs after doing a deal with a major Indian bank. But these are the exceptions.